US: Jihadi bride has buyers’ remorse, wants back in after Islamic State dream collapses……. – The Tundra Tabloids……. 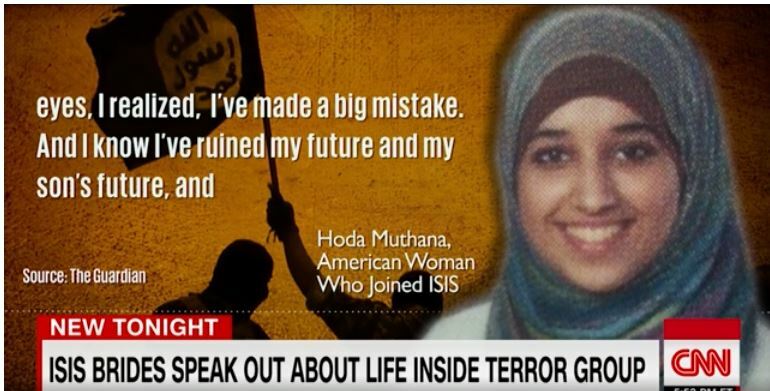 US: Jihadi bride has buyers’ remorse, wants back in after Islamic State dream collapses……. She joined ISIS at a time when much about the Islamonazi terror group was being published. She knew what they were about long before she pulled up her tent stakes and headed for Syria. At least in the English press stories like these are being published (no matter how much of a puff-piece they may be), here in Finland, they’ve allowed many of these vermin back into the country with politicians actually hoping to rehabilitate them, giving them affordable housing, welfare subsidies and opportunities for acquiring job skills. Unbelievable. NOTE: Given the history of this woman’s life choices, does anyone really believe that she would be an asset to the people of Alabama? Five years and three husbands later, she says she regrets what she did and is begging to return to the US. But after witnessing the devastation of war, including the death of two husbands, Muthana said she became disillusioned. Previous Post Previous Post Brian of London speaks on the recent diplomatic spat between Poland and Israel over the Holocaust……. Next Post Next Post UK strips Islamonazi ISIS bride of her citizenship, her family sues in court…….